A: What can visitors expect at the Plaza of Nations this Sunday, Sri Venu? SV: When people first arrive at 9:45am, they’ll see a big stage with traditional Indian music playing. Shortly afterwards Sri Prameyaji from temple Shree Mahalakshmi will lead the sacred fire ceremony. June 21st is also National Aboriginal Day, and we have invited the highly esteemed Chief Phil Lane Jr. who is both of the Yanton Sioux Nation and Chickasaw Nation. He will welcome everyone to the event. It is interesting to note that Phil is a long time yogi, and has spent time in the Sivananda ashram in India. The welcome will be followed by speeches from dignitaries about this significant day. The visitors will also experience a full on hatha yoga class, led by a group of senior yoga teachers from all over North America. They will be teaching classical postures from 11am-12:15pm. The event will be hands on, and interactive, so please bring your yoga mats and water. We welcome all, so feel free to bring your dog and children along! For music lovers, we will have a host of talented musicians and singers performing live kirtan from 3-3:30pm. This will be followed by a ten minute guided meditation, and close with a final prayer. The Plaza of Nations can easily hold up to 15,000 people. Visitors can browse the vendors made up of yoga studios and conscious businesses. Then they can partake in the yoga classes, enjoy the kirtan music, and hear speeches from a host of senior yoga teachers about how yoga has changed their lives. A: Why is it so important for the government of India to promote Yoga through this day around the world? SV: Prime Minister Modi, a yogi himself strongly believes that Yoga can help heal our world. Also, I’m convinced that India wants the world to remember where Yoga is from. The international day of Yoga is a great way to remind people of all the aspects of yoga including meditation, pranayama, and other traditional techniques. Too often in the West, yoga is only practiced as a physical discipline and it is our role as yogis to do this professionally, but also to teach all the 8 limbs of yoga not just asana. A: Om on the bridge caused a lot of controversy, what are your thoughts on it? SV: We don’t know too much about that, we stick to what we know which is teaching the ancient tradition of yoga and holding our event at Plaza of Nations. A: Yoga in the modern age can be described as culturally appropriated or diluted from it’s original form. Would the gurus and swamis that first brought it to the West be rolling in their graves if they saw what has happened? Some yoga classes have been devolved into being no different than an aerobics class with party music. SV: Yoga means union, and I have been teaching and practicing Yoga for decades. I have seen much diversity and exploration of yoga in the West. I welcome it all, since each generation of yoga teachers brings something new to people. Traditional yoga is designed to prepare the body for meditation. This is so one can better connect and unite with the source, yoga is much more than just asana. It’s NOT just about exercise, and when people do practice asana, say their mantras, meditate regularly, they receive the full benefits of yoga. They develop mental wellness, and emotional balance because the whole thing is about self-realization! Some people first come to yoga to get fit and have more flexibility, and then get exposed to the other 7 limbs of yoga, and some will never explore any further and that’s okay for now. A: What are your thoughts about doing yoga on paddle board? I hear it’s all the rave now. How can that be done? SV: I practice yoga everyday on the dock since I live in a boat, doing headstands. It helps with balance, so I can see how it can be done. The locations of where you do the yoga don’t matter that much, what remains is the benefit of yoga. A: What about acroyoga? That looks more circus like than yoga? SV: It actually takes a lot of discipline to do acro yoga, and many acro yogis practice meditation and do their mantras so we welcome it. A: Why is this event important? SV: Vancouver has become the epicenter of the Yoga movement in the West. As a senior Yoga teacher, it’s wonderful to see the diversity and exploration of each generation. We want to invite everyone to enjoy yoga together, through this unity, celebrate and acknowledge the country of India and the pioneer teachers who brought this incredible gift to the west. Most notably, Swami Vivekananda, Paramahamsa Yogananda, Swami Vishnudevananda, Swami Radha, Sri Indra Devi, BKS Iyengar, Swami Satchitananda, A.C. Bhaktivedanta Swami Prabhupada, Sri Pattabhi Jois, Maharishi Mahesh Yogi and the great masters that inspired them such as Swami Sivananda, Sri Aurobindo and Sri Krishnamacharya. We also want to acknowledge all the senior Yoga teachers in Vancouver that have contributed to making yoga such a thriving force locally. A: So this event sounds like it has much to offer- Food, Fun, Music, Yoga, Talks and it’s all free! If there is one message you want people to walk away with, what would that be? SV: Yoga means “Union”. We’re all one. I want people to walk away with feelings of peace, health and harmony. Sri Venu (Stéphane Boisjoly) Born in Montréal Sri Venu is a Canadian from Abenaki First Nation and French ancestry. He started to practice Yoga and Meditation daily in 1969. In 1971 he moved to the Sivananda Yoga Vedanta Ashram in Québec to study full time with Swami Vishnudevananda. 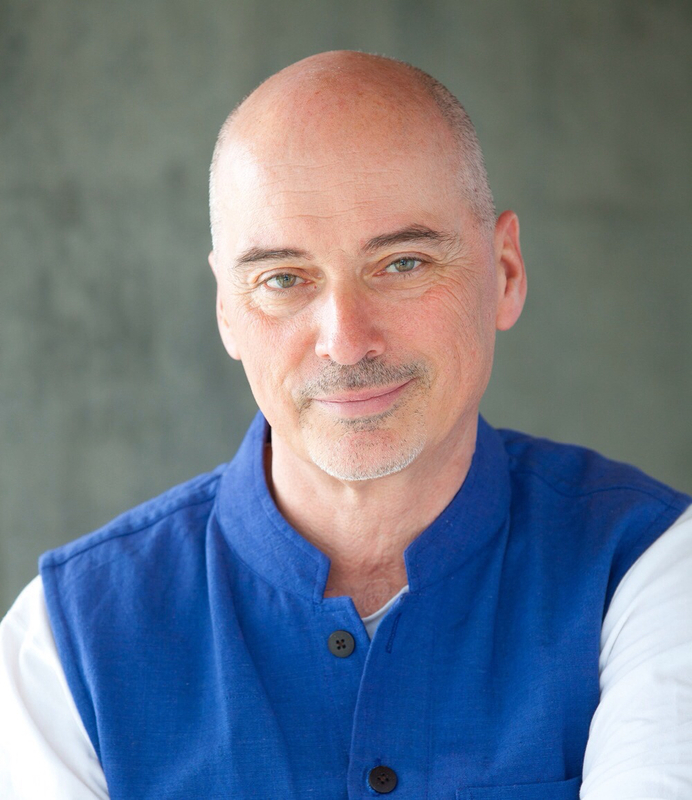 One of North America's most experienced Yoga Acharyas, Stéphane (Sri Venu) started to teach at the Sivananda Headquarters in 1972 and continued his advanced training in the Sivananda Ashram California and in British Columbia until 1976. Also a graduate of the International Meditation Institute of India his studies take him to the Sivananda Ashram in Kerala, Auroville in Pondicherry, the Divine Life Society in Rishikesh and Kullu-Manali in the Himalayas. Founder of the Vancouver Sivananda Centre, Sri Venu teaches traditional East Indian Yoga, Meditation, Philosophy and Chanting. Sri Venu is also a professional Television broadcaster and has recently held the position of Regional director of French CBC-Radio Canada in Vancouver and of Broadcast Manager of the Vancouver Winter Games in 2010 and of the London Olympics in 2012. With the production company InformAction and Director Carlos Ferrand he completed Planet Yoga in 2011, a documentary feature film on Yoga around the world and the role of Swami Vishnudevananda in bringing it to the West. This feature film has been released in Film Festivals and Theatres and has been broadcast on Television Networks around the world including CBC/Radio-Canada. Sri Venu also trains Yoga and Advanced Yoga Teachers at the Sivananda Centre, at Langara College in Vancouver and other fine Yoga Institutions. He is registered (E.R.Y.T. 500) with the Yoga Alliance and Registered Senior Teacher with the Yoga Association of BC. 12:30 pm Senior yoga teachers will each come and speak for 10 minutes sharing their thoughts and feelings on the evolution and impact of Yoga on their lives.